If you were in the mood for something hard and heavy, this show at The Pageant was the place to be. St. Louis was the lucky recipient of one of only seven shows this trio had scheduled back in January. 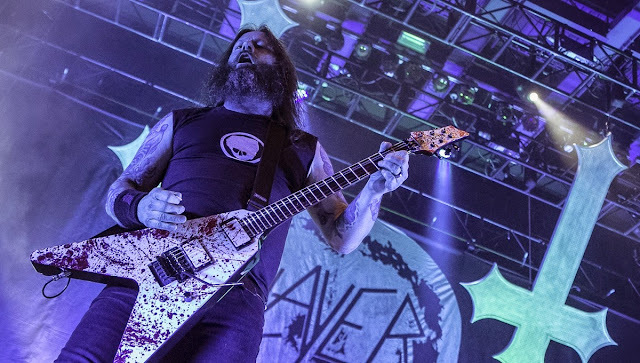 All three bands were anticipating playing with one another as Slayer guitarist Kerry King said it had been over twenty years since Slayer had played a show with Suicidal Tendencies. Exodus was the first band to confront this sold out, SRO show. As one could imagine with a show of this magnitude, it did not take long for the mosh pit festivities to begin. Exodus has been thrashing it up since 1980 and was co-founded by Metallica guitarist, Kirk Hammett. Through the many lineup changes, Exodus has continued to endure and is rocking harder than ever with this current lineup. With barely time for fans to make it to the restroom and back, Suicidal Tendencies took their places on the stage. Tendencies have also secured their spot in thrash metal history with a thirty-plus year career. I can tell you I first saw this band in 1987 and they are aging like a fine wine. Front man Mike Muir has not skipped a beat and remains the band’s constant throughout the many ups and downs the band has endured over the years. Taking only a brief pause from his perpetual bobbing and weaving, Muir took a second to remind attendees to pick themselves back up when life knocks you down.